It’s the most wonderful time of the year, a time where we can all go shopping without guilt in the name of “holiday spirit” lol. The number one thing about the holidays in most people’s mind is their family EVEN those family members that drive you crazy you enjoy them that much more . If your anything like me you wait until there are AWESOME coupons, discounts and deals… so many holiday savings. We know that there are many last minute shoppers SO hurry over and check out all the savings AND get all those gifts for the family that you love! No need to wait for Black Friday or Cyber Monday, just check out the coupons and deals on Your Life After 25’s coupons & discounts page. NOT only are we spreading the word about all of those amazing deals we are also giving you the chance to Win: Your Life After 25 Holiday Savings and Coupon Giveaway! How great is this giveaway to help get you started on that shopping!?! There are three winners too! Do you have any tips for holiday shopping? We set a budget for our holiday gift and one of things my husband and I find helpful is to write down everything we purchase and keep it on a shared google drive sheet. This helps us to stay focused when we are out shopping, and to also remember who and who I haven’t bought for yet. 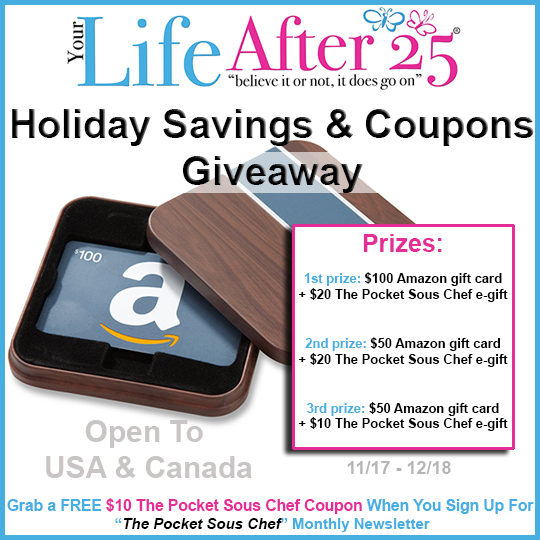 Check out the giveaway below to enter to win a $100 Amazon e-gift card + $20 The Pocket Sous Chef e-gift, a $50 Amazon e-gift card + $20 The Pocket Sous Chef e-gift, or a $50 Amazon e-gift card + $10 The Pocket Sous Chef e-gift! Giveaway ends December 18th! Open to US & Canada. Winners will be chosen at random through Giveaway Tools. Giveaway ends December 18th at 11:59pm ET. Winners will be notified via email or Twitter DM. Mom Powered Media & associated bloggers are not responsible for prize fulfillment. Each winner will have 48 hours to respond before a new winner is chosen. Must be 18 years or older to enter. Unlimited Entries. Void where prohibited. Entering the giveaway means you agree to terms above. Good Luck! Love Amazon! I would be happy with just winning 3rd Prize.